Jessica Ruano, originally uploaded by johnwmacdonald. I went to photograph a piece of artwork by David Cation at Guy Berube's La Petite Mort Gallery this afternoon. 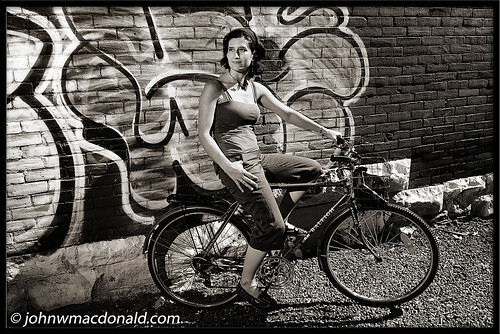 During the shoot Jessica Ruano of Ottawa Arts Newsletter saw me in the alley snapping away. I asked her if she wanted to pose for me for an impromptu photo. Here's a shot.